Never thought I’d have to carry one of these around…. We just found out that our 14 month old daughter has food allergies (as we have suspected) but more than we originally thought. As an infant, Eleanor would have “naked baby time” and lay on the ground on a blanket. We knew she had eczema but we quickly realized she was also getting little hives here and there that would randomly appear. We had our theories that maybe she was sensitive to the blanket or maybe there was dust on it and she was allergic to dust, etc. etc. Or MAYBE she was allergic to pet dander. We have two cats and a dog so I shut that thought down really quickly not wanting to think about having to remove our pets, especially our dog Ruby. Soon we also noticed when the dog would happen to lick Eleanor’s face that there would be hives where Ruby licked. Then we really started thinking hmm….she’s probably allergic. So we’ve kept her away from the cats and dog and she really doesn’t have any other symptoms besides hives with direct contact. If you read my first post you know Eleanor was a very upset and colicky infant. Her pediatrician suspected it could be a milk allergy that is making her so upset based on some interesting dirty diapers and her demeanor so I avoided dairy and when I finished with breastfeeding we put her on a hypoallergenic formula (don’t do it if you don’t have to….so expensive!). She did ok on the formula. When she turned one we decided Eleanor could try some ice cream!! She looooved it. And then 2 minutes later we took a look at her and she had white and red raised bumps around her mouth. 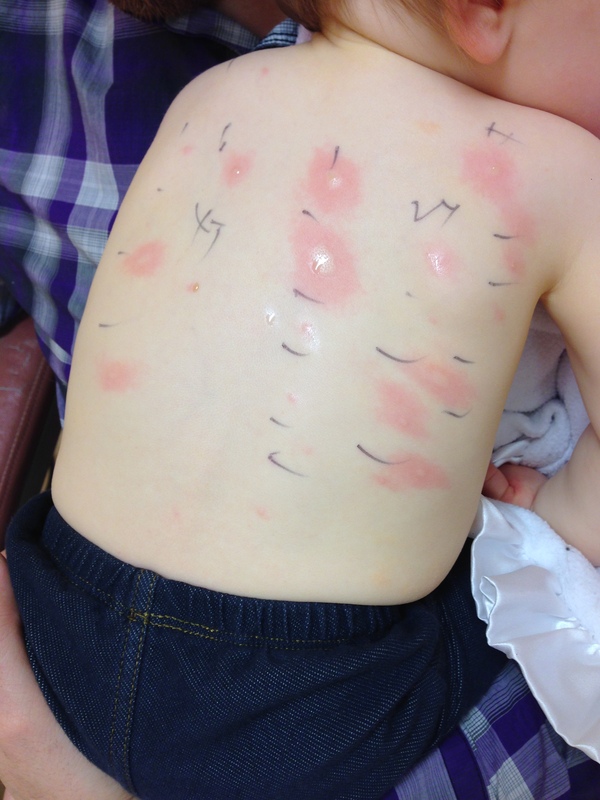 Fast forward a couple months to December and we end up at the allergist for testing. After an hour and a half of waiting, some serious baby distracting, 20 skin pricks on Eleanor’s back, and tears, the nurse came in to read the results and quickly started listing: eggs, milk, cats, dogs, and tree nuts. This is where my head started spinning. I know this is not the end of the world and so many people have to deal with allergies. It’s just one more thing to have to think about, keep track of, and yes, worry about. We already had to avoid dairy but now eggs?? Tree nuts?? I don’t know anything when it comes to food allergies. Will she be one of the kids that has to sit at a separate nut-free table at lunch? Will I trust others to avoid her allergens when I’m not around? Will she get a nutritionally balanced diet now? We felt a little rushed at her appointment (who doesn’t these days) plus Eleanor had hit her limit for tolerating ANYTHING so we barely got to ask questions. 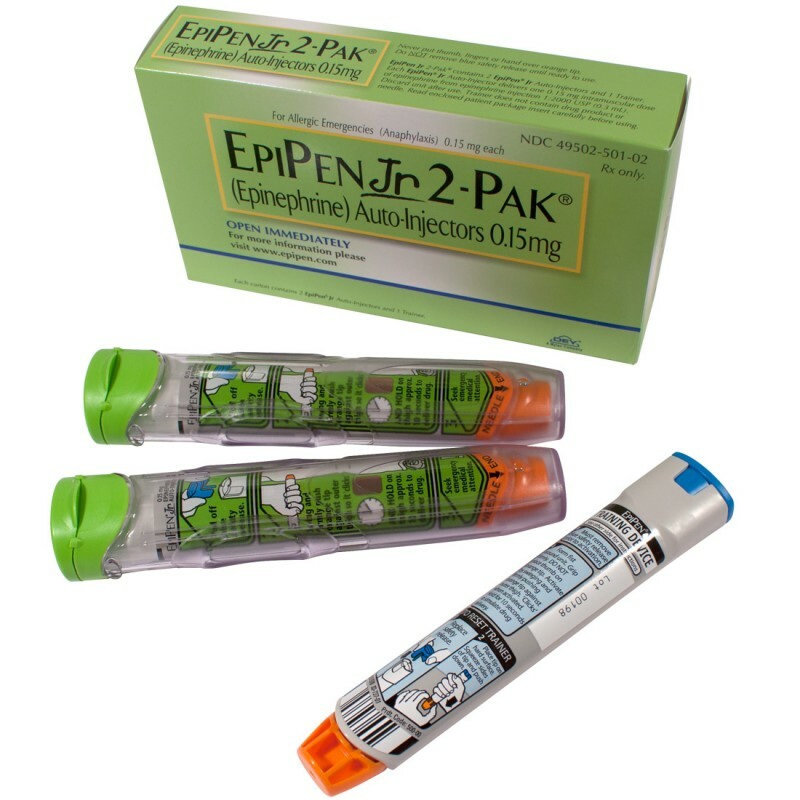 We bought some epi-pens at the Doctors suggestion ($600 thanks to high deductible insurance), have to start dissecting food labels and need to figure out how to feed our daughter a nutritionally balanced diet. Knowing my past with Dr. Google and serious anxiety, I am trying to limit going online but it can be a good resource for learning about food allergies or food substitutes, if I’m careful. I refuse to let myself go down the “could I have done anything different to prevent this” path. It won’t change things and will only make me feel worse. There are many theories out there too about why so many kids today have food allergies such as the theory about a link between food dyes/coloring and allergies. 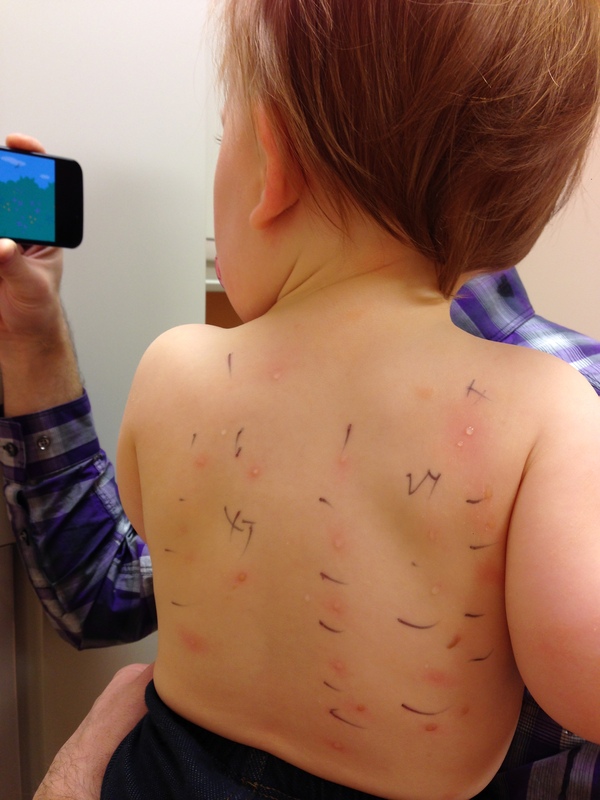 Maybe we will go see a nutritionist and get some guidance because we didn’t get much from the allergist. I’m not saying I believe it’s his job to help with her diet but they should at least guide us toward helpful resources. Milk, eggs, and nuts are a big part of our every day diet and have some serious nutritional benefits but when it comes to other foods I don’t have much of a clue what kind of nutritional value certain foods have. And for the cat and dog allergies? So far we have not seen enough upsetting symptoms to get rid of any of them but we have purchased 2 air purifiers and made her room completely off-limits to the pets. Time will tell. Thanks so much Heddi! It is so nice to hear from someone that has gone through the same thing and also to hear that your son outgrew some of his allergens. I will certainly check out those resources. Take care!